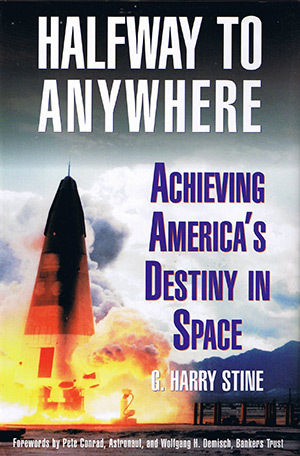 Along with Space Power, this is one of the late G. Harry Stine’s most important books and is highly recommended for anyone interested in getting the human race into space. Although out of print, as of this writing the book is still easy to find and is inexpensive to add to one’s own personal library (check the hardbound price as it may be cheaper than the paperback). The subject of the book is how to greatly reduce the cost of getting to orbit. 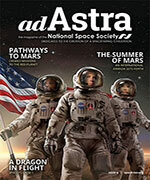 The title comes from Robert A. Heinlein’s observation “Get to low-Earth orbit and you’re halfway to anywhere in the solar system.” There are Forewords by Astronaut Pete Conrad and by Wolfgang H. Demisch of the Bankers Trust. The book is non-technical and well-written. Part I describes the historical development of the idea of a completely reusable single-stage-to-orbit (SSTO) vehicle that is considered technically feasible by some (but not by others) and which has yet to be built. Part II describes the fascinating inside story of the Delta Clipper – the first fully reusable rocket ever built and successfully flown. Even if you know the eventual outcome, it makes for exciting reading. Of particular importance is not the technology of the Delta Clipper – which used off-the-shelf parts, some of which came from Wal-Mart – but the design and managerial philosophy that produced large gains on relatively small budgets. This is one of the most important messages of the book. Part III describes in more general terms what are the characteristics of airline-like operations for SSTO vehicles: complete reusability and rapid turn-around, flight safety and reliability comparable to existing airlines, and ground crew, support facilities (spaceports), and overall economics also comparable to airline paradigms. Stine also discusses the market forces that can both lead to and result from such an operation, and some regulatory issues that need to be addressed. Stine’s books in general tend to be overly optimistic about the time frame in which the changes he envisions will actually take place. This book is no exception. It was written up to a publishing deadline of July 10, 1996. Just three weeks later on July 31, on the fourth test flight of the rebuilt Delta Clipper DC-XA, a landing strut failed to extend, the vehicle tipped over, the LOX tank exploded, and the vehicle was destroyed. No funding has been forthcoming to build another. On July 2nd of that same year, NASA’s follow-on program, the X-33, was (to the consternation of many) awarded to the Lockheed-Martin “VentureStar” design and not to the McDonnell Douglas Delta Clipper design. Whatever the relative merits may have been between these competing designs, the result was that the X-33 program was cancelled in 2001 after consuming over a billion dollars and producing no flight vehicle. 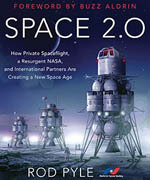 It is interesting to compare Stine’s book to the more recent and more academic treatment in the book Single Stage to Orbit by Andrew J. Butrica (2003), which is part of the New Series in NASA History published by Johns Hopkins University. Butrica was assigned to write the official history of the X-33, but since that program failed most of the book covers instead the successful-until-unfunded Delta Clipper project. Much of this book parallels Part II of Stine’s book quite closely. It is now ten years after Stine’s book was written, and we are no closer to attaining a workable SSTO. This does not diminish the importance of Stine’s message, but rather increases it. I highly recommend this book to anyone who cares about the future.